A woman in India has given birth to conjoined twin girls – who appear to have two heads and one shared body, the Independent reported. The infants were born via cesarean section at Cygnus J.K. Hindu Hospital in Sonipat, Haryana. They suffer from dicephalic parapagus, meaning they have separate spinal cords, necks and heads, but they share all major limbs and vital organs. Conjoined twins with this condition typically cannot be separated. According to the Independent, the babies’ parents could not afford an ultrasound, which would have picked up on their condition in utero. “The parents are very distressed, and we are helping the family the best we can,” said Dr. Shikha Malik, who delivered the babies. The twins are currently in the hospital’s intensive care unit (ICU), and doctors are worried that they have a very slim chance of survival. 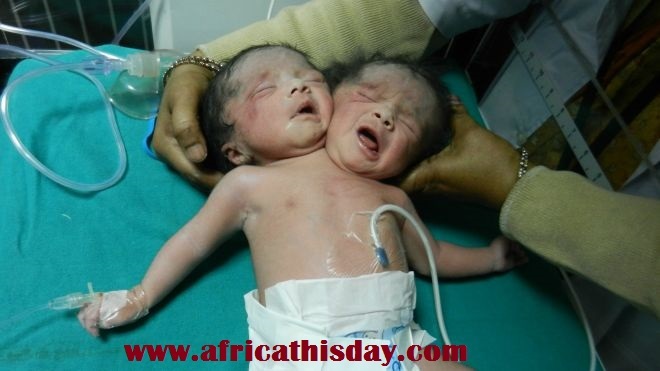 This entry was posted in Uncategorized and tagged baby, baby with two heads., dicephalic parapagus, health, india.